Does a brand new hybrid have a lower climate footprint? After jumping around cars for a while and waking up and learning the hard way that financially this was a poor decision I went for the old reliable car. I had finally let my new car go and was at ground zero. After driving around to a couple salvaged…. or “used” car dealerships I found a decent running 98 4Runner. It had about 274,000 miles on its well-used engine, a Denver Broncos Sticker, and the windshield wipers didn’t work. Oh, and there were no windshield wiper spray nozzles. Those cost extra. The bumper was crooked and the hood was definitely spray painted white…. so the car had obviously smacked into something regardless of what the carfax was saying. Well I took the risk, and so far it has worked out. I actually really like the car and I have barely had to do any work to it. Although recently I have been wondering if I should keep or replace this car since it isn’t getting the best gas mileage? Should I go buy a brand-new hybrid so I’m not destroying the earth with my poor gas mileage? I manage about 20 to 21 miles per gallon (MPG) probably because I drive so slow. Borderline asleep turtle slow. Realistically the best option is to bike and use public transit, which I already utilize often, but what about when I do decide to jump into the luxurious heated recliner on wheels? Here we are. You (and I) feel guilty and you know that your single occupancy vehicle (SOV) habit is like second hand smoke for mother earth and all the other inhabitants. You want to right this wrong, but so much marketing and blah blah and your “know it all” friend/neighbor/whoever who owns that Tesla wants you to buy “BLAH” car and join the illuminati cult of electric vehicle (EV) owners because only then you’ll become the incarnate of Captain Planet and save the earth. Well then. Should you buy a fancy hybrid, brand new, plastic wrapped, new car smelly smell, or should you keep that dinged up, dented, only “kind of” been in “no accidents” Toyota 4Runner that you picked up from the cash only car dealer? Quick Answer: Keep your current car if it gets above 25 MPG until it has reached its end of life, oh and drive less (bike, walk, longboard, whatever it is. Get a workout in). Especially keep that car if you’re above 30 MPG and drive the wheels off that thing. After that thing is dead get a used EV and charge it with some renewable energy like Mr. Money Mustache did (an analysis covering the EV to come later). I purchased the Toyota 4Runner, but now the deed is done and for me to swap over to a new hybrid car it would take over 50,000 miles of driving that hybrid until the hybrid has a lower impact on the environment! Also, those miles would not be emission free. Surprise! Driving that car still causes CO2 emissions. Another surprise (or maybe something you didn’t’ think about), but making and manufacturing that new car creates emissions as well. 97.3 Million cars were made last year compared to 77.5 million were made in 2010 (International Organization of Motor Vehicle Manufacturers, 2017). I think we have enough cars at this point and I have no idea why we need so many new cars when the current ones work just fine. Also making a car is not carbon free. HEADS UP: Clicking this image will take you to the actual calculator. I don’t have the funds to embed it yet. But you can sponsor me and get this embedded! Why does making a car have an impact? This is because every car requires raw material (steel, aluminum, gold, copper, etc. etc. etc.) so it is mined, refined, transported and so on. Then the car is built, and all the various parts and pieces are brought in and machined, cut, painted, sprayed with chemicals, assembled and so on. Oh, and the factory that this is done at requires power which is generally coal or some sort of fossil fuel. All of this is done before the car even turns the engine over once. If you are satisfied with this answer to why you should keep your current car do one thing before you go. Check out this quick climate footprint calculator to understand your climate footprint and the CO2 you have contributed to earth from your car purchase and driving habits. I used the tree seedling number from the equivalency calculator created by EPA within my calculator to show how many baby trees you’d have to plant to offset your car damage. Once you know your climate footprint and the metric tons of CO2 you have emitted head to Equivalency Calculator by clicking this paragraph your number to get an idea of other equivalents such as amount of coal burned or homes electricity for a year. The calculator image takes you to the actual calculator. I have to pay extra to embed the calculator on this website, so unless you want to sponsor me I gotta save that chedda for now. Alright now lets get to the details. How did I get the above answers? Lets start by looking at figure 1 which is a quick explanation of a life cycle analysis for a vehicle. One assumption we will be making during this analysis is that you carry your own personal “CO2 Footprint” and this car purchase comes with a “CO2” debt. For example, any car you purchase emits between 7 to 16 metric tons (depending on car size, maker, etc.) of CO2 during manufacturing and you are picking up this debt. Arguably used car manufacturing emissions could be split between multiple owners in the future, but to keep it simple it will be a debt picked up by each owner. Because if you never bought the car or needed the car it would have never been made anyways. I found data showing manufacturing an internal combustion engine (ICE) car was estimated to emit between 8 and 12 tonnes of CO2. I split the difference and used 10 metric tons. This data was found from multiple resources and I go into that in more detail below. Burning 1 gallon of gasoline emits 8887 grams of CO2 (Environmental Protection Agency, 2018). Below is the equation I used for all the following estimates when calculating the emissions from driving. I’m not including the unit conversion from grams to metric tons, but it is common to report CO2 emissions as Metric Tons or Tonnes. Ok now that we have that out of the way, let’s walk through this. 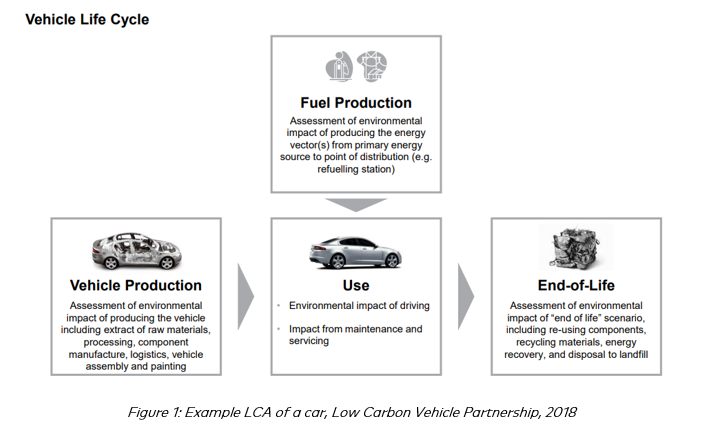 Audi and Mercedes are thankfully very transparent and are sharing their life cycle analysis (LCA) data publicly on their website. I used their data as a reference along with a few others. Below is a table of the estimated emissions from various cars/engine types, along with the sources of the data. It appears (shocking) the larger cars and the larger cars with extra batteries for hybrid motors require more materials and manufacturing methods therefore have higher emissions. Table 1: Various manufacturing emissions from different cars. A traditional ICE Audi Q7 emits about 12 tons of CO2 during its production process (Audi,2016). A plug-in hybrid Audi Q7 emits 16 tonnes of CO2 during production (Audi, 2016). Then from there the car is estimated to last 200,000 kilometers before it is considered done or at end of life (EOL). Obviously, this can vary, but this is the rough estimate. For the hybrid purchase to make sense on current power sources (because this car is something you can plug in but that electricity is made by coal and natural gas currently in most countries U.S. Energy Information Administration, 2016) You would have to drive it about 79,000 miles (128,000 km) until it had a lower impact on the earth than the ICE vehicle, and this only includes CO2 emissions. If the car was powered from renewables the breakeven is much sooner around 23,600 miles (38,000km) but this is not the case in most parts of the world (as Audi acknowledges as well). Below is the plot showing the Audi Q7 footprint from the LCA they conducted. As far as my climate footprint across all my (short) years of driving I would have been better off just sticking to one hummer my whole life. I have owned about 8 vehicles. From that first car to the after-college fancy car I’ve made my fair share of foolish car investments. See Figure 3 below where I plotted my total footprint and then the various emissions from driving different MPG cars across the total miles I have driven. Each car purchased has a spike for the immediate CO2 debt I am taking on by purchasing that vehicle. After that I drove it for a bit then jumped into another car. Below that jagged nasty line are multiple “one vehicle” alternatives plotted ranging from one 10 MPG vehicle to one 40 MPG vehicle. As you can see it would been more beneficial for me to drive a 10 MPG vehicle my whole life. Using equation 1 I calculated the various impacts across my life and that hummer would have been a better choice following my above assumptions. If your car is getting above 25 MPG or greater there isn’t a just cause to purchase a new vehicle as shown in the demonstration above. Wait till the “end of life” of that vehicle then make the unfortunate necessary evil decision of purchasing a newer and probably even more efficient car at that point. Why is this? Figure 4: Break even comparison for hybrid car purchase. In my personal scenario I only drive about 6,000 to 10,000 miles per year. If I were to go and purchase a hybrid that gets maybe 50 mpg it would take 50,000 miles of driving until the hybrid begins to have a lower footprint on the environment. I would have a lower impact on the environment for those first 50,000 miles by sticking to driving my 20 MPG, 1998 Toyota 4Runner. This is because the hybrid would come with potentially 16 Tonnes of CO­2 attached to it before I even turned the key (assuming it has an equal footprint to the hybrid Audi Q7. Unfortunately, Toyota doesn’t have a clear LCA with a clear number associated with the emissions involved during manufacturing a hybrid). Also, if we are assuming that the life of the car is 200,000 kilometers or about 124,000 miles this hybrid vehicle would be 40% used up before it even breaks even! What if your car gets better gas mileage than my 4Runner? If you get 30 MPG you won’t break even after 100,000 miles of driving! You would have to take that car past its estimated life before it became a better choice for the environment! See the chart below. Equation 1 was applied from above to calculate CO2 per mile driven for the below and above and all charts. This is a tough one, but for me the message is clear. Stop purchasing different and multiple vehicles ya ding dong and keep a good one running. Instead I will budget out my 50,000 miles and I will use public transit more and ride my bike more and try to stop driving altogether. After that 4Runner is either at the break even point or dead maybe in the 10 years that took maybe there will be a sweet used self-driving electric car on the market. In the meantime, the numbers show to drive less and buy only one car. Below are my references and feel free to leave any questions, comments, etc., but whatever you do don’t go buy a new car. It is a waste of money (check out Mr. Money Mustache’s point of view on the financial implications of new cars) and a new car leaves a climate footprint even if it doesn’t ever run.